The original Yanmar 3JH2E engine has 1080 hours on her. The wind, nav, depth, and autopilot are B&G instruments. Radar is Furuno. Has a Maxwell windless. Has a Heart Interface Freedom 25 converter/30A-battery charger. Put in 5 new batteries in 2016. Solar Panel to trickle charge battery bank #1. Has a Nauti Kold cold box that works great and is very efficient. Has a Cruisair air conditioning system that has been keeping things nice and cool (new in 2009). Flat screen TV, DVD player, and AM/FM CD player. There are 24 aluminum folding steps that have been mounted all the way up to the mast head to make single handed maintenance a lot easier. Two extremely special Island Packet name and logo stainless steel fancy step plates were installed to make going aboard on the port or starboard side, that much more special. Purchased in 2003, upgraded and always kept everything in excellent condition until 3 years ago when I stopped sailing. Since then, I periodically run the engine at the dock, keep up on bottom cleaning, and keep a/c running 24/7. The engine runs great. The transmission is stuck in forward (not the cable). The trans never had a problem before this period of me not using my boat. The bow-thruster needs replacing (a great feature to have). Original sails are in good shape but sheet lines could use replacing. The Bimini Top is removed due to a rip and the zipper becoming unstitched. Dodger's plastic windows are foggy. Inside teak is beautiful but the outside teak needs the remaining varnish removed and reapplied. The complete interior looks brand new and has no foul smells. The bottom needs repainting. I got an estimate of $3811 to replace the bow thruster. Bottom paint job and a boat haul have cost about $1000 in the past. I guesstimate to remove, repair, and install the transmission could cost about $2500. Additionally includes: 8.5' dingy purchased in 2014 and has Mercury outboard that can store on a IP-350's stern rail mount. Both have been stored indoors. Outboard serviced and clean carburetor in 2015. All manuals and documents for every component, kept well filed in an Island Packet documents bag. All receipts and files from time of purchase in 2003. Two large plastic bins that contain lots and lots of new spare maintenance parts. New condition and unused spare dodger (but in yellow). Sail bags, 10 one inch thick dock lines, life jackets, dock poles, grill that mounts at stern, safety equipment and much more. ISLAND PACKET 350 - STANDARD SPECIFICATIONS & EQUIPMENTYACHT CONSTRUCTION, CERTIFIED CATEGORY A – OCEAN Rig / Sails / Hardware Sails: Roller furling main for standard in-mast system, 130% roller furling genoa, roller furling staysail -Genoa & staysail sun panels are green. Genoa gear, including tracks, blocks, sheets and Harken ® furling system. Staysail gear including blocks, halyard, sheet, Harken ® furling system and Hoyt self vanging boom. Jib halyard winch on mast, Lewmar ® 16C 2-speed. Mainsail gear, including halyard on mast led to Lewmar 16C winch; main sheet traveler w/4:1 control system led to cockpit; roller furling lines, sheet, and spare main halyard led to cockpit through stoppers to Lewmar 30CST winches. Spare main halyard (on roller bearing masthead sheave) led to cockpit through stopper to Lewmar ® 30 CST winch. All halyards internal; color coded running rigging, convenient coaming storage bins for lines. Boom vang. Winch handle -10" lock-in chrome - Lewmar "PowerGrip ® " Jib sheet winches (2) Lewmar ® 40 CST 2-speed. Mid-boom sheeting for unobstructed cockpit & dodger installations. Wheel steering - console mounted Whitlock "Premier XL" rack & pinion direct system w/"Monarch" style hood for electronicsinstallations, wheel brake, stainless steel wheel. Guard, single lever engine control. Emergency tiller with storage brackets in sail locker. Compass, Ritchie ® with custom Island Packet nav grid. Welded stainless steel double bow rail & stern rail, stanchions, stern rail with twin seats, stainless steel flag staff & holder. Double lifelines w/side gates, full length stainless steel cabin top hand rails. Teak step pads at lifeline gates with reefing line hold down recess. Hinged padeyes (4) for cockpit harness attachment. Stern gate w/quick release hook. Swim ladder - stainless steel transom mount w/rubber treads. Two SeaSafe TM patented stainless steel anchor rollers w/chocks and hinged deck pipes to forepeak. Four 12" mooring cleats, two 10" spring line cleats, chocks & flush mount stainless steel chafe guards. Twin backstays for easy stern boarding & unobstructed helm seating. Topping lift-adjustable. Keel stepped mast, all anodized spars. Interior Eleven opening ports w/screens - polished stainless steel, safety glass. Five deck hatches - forward cabin, salon, head, aft cabin, galley-Lewmar ® (acrylic & aluminum). Three deck ventilators (Dorade type) w/screens. Large forepeak w/louvered access door & overhead deck pipes, light, drain to bilge, Starboard ® shelf to direct rode aft; center divider w/ attachment for rodes. Forward cabin w/privacy doors to salon & head compartment. Large double Pullman berth w/teak shelves outboard,stowage under. Dressing seat, cedar lined hanging locker w/shelf over, bureau w/shelf over. Two opening ports plusoverhead hatch, deck vent, varnished teak & holly sole. Forward head w/shower (electric drain pump), teak trim, curtain on track, large vanity with polished stainless steel sink, teak shower seat, storage cabinets, opening port & an overhead hatch, toothbrush holder w/cup, toilet paper holder, integral recessed lighting. Main salon w/L-shaped pull-out double settee berth to starboard, single settee berth to port, teak cabinets & book shelves outboard of both settees. Large stowage areas behind & under each settee. Cedar lined hanging locker w/shelf over. Deluxe drop leaf table folds against bulkhead rack (w/bottle stowage) for unobstructed 4' wide varnished teak & holly sole. Large overhead hatch, numerous opening ports, deck vents & overhead handrails. Navigation station w/table at aft end of port settee, nav light, generous nav/electronics cabinet w/master A-C/D-C electricalpanel plus room for owner installed equipment Chart stowage drawer beneath starboard settee. Aft cabin w/privacy door to main cabin. Large athwartship double berth w/teak shelf outboard, integral overhead reading lights, stowage lockers under. Cedar lined hanging locker w/shelf over, bureau w/shelf over, two opening ports plus overhead hatch, varnished teak & holly sole. Courtesy/night lights with switch by companionway. All interior cushions of upholstery grade dual density foam covered in premium designer fabric. Removable teak companionway ladder w/engine access from all sides. Storage rack for companionway drop boards. Molded slip resistant cabin sole adjacent to companionway, galley & nav station, w/draining grate in front of ladder. Teak gratelifts out for dust pan, dust pan lifts for bilge sump access with light. Teak bulkheads, cabinetry, trim - select grain w/ hand rubbed oil finish. Teak louvered cabin & locker doors - deluxe trim; push button safety latches on locker doors. Molded fiberglass interior headliner w/textured finish, teak trim. Teak & holly sole in main salon, forward & aft cabins - varnish finish. Galley Large u-shaped design w/high pressure laminate surfaces, teak sea rails on all edges. Ice box - top loading, injected froth type urethane insulation throughout, lift-out shelf, electric drain pump, inside light w/manual switch. Gimballed two burner LPG stove w/oven - black finish stainless steel deluxe safety type w/sealed burner top, lift off cover w/storage, rack below, stainless steel guard rail w/harness hooks. Pot and pan locker under. Double stainless steel sink with deluxe polished finish, hot & cold pressure water tap, manual pump, retractable spray unit. Roll-away trash bin, teak paper towel holder & soap rack. Deluxe teak dish rack & cutlery drawers. Large storage areas above & below counter, two large drawers beneath icebox, dry storage locker. Cockpit instrument access cabinet. Exterior/Construction 100% hand laid high modulus fiberglass construction throughout with special gelcoats for durability. All gelcoats applied using premium high volume, low pressure application equipment for exceptional finish quality, reduced airborne emissions. Island Packet’s exclusive PolyClad ® 2 hull bottom gelcoat system with Hull molded in one piece utilizing a proprietary pressure fed application system w/high modulus triaxial glass, unified w/an engineered interior grid structure and molded structural base unit. Deck laminate cored w/advanced PolyCore ® - a proprietary microsphere & resin matrix with 10 year limited warranty for rot and delamination (an industry first). Exclusive Durashield™ deck, hull topside and interior gelcoat system with superior gloss retention and resistance to fading and crazing. Deck attached to integrally molded hull flange w/bolts, lock nuts, & urethane adhesive sealant. Deck hardware thru-bolted w/aluminum backup plates Two-tone deck - low-glare light ivory with integrally molded light tan slip resistant surface (premium coarse diamond pattern)Light ivory hull with matching co-extruded, hi-impact vinyl rubrail, s.s. striker, green boot stripe. Teak cap rail w/stainless steel striker, teak cap on bowsprit. Deluxe helm console with guard/handgrip, compass, single lever engine control, space for electronics (B&G Wind, Nav, and Autopilot installed). Contoured cockpit seats 7..../ 2 feet long, coaming storage boxes and bins, seat hatches with push button latches, locks, and support struts, molded helm seat with teak top, cushion and backrest. Two stern rail seats. Molded fiberglass sliding companionway hatch w/sea hood, latch inside, exterior hasp and lock. Integral molded dodger mount on cabin top. Companionway drop boards of solid teak, center drop board fitted with fixed port with etched logo (safety glass), captive safety lock-in pin with holder, interior storage rack. All exterior teak treated with Sikkens Cetol ® teak finish. Two 2" cockpit scuppers. Cockpit ice box - foam insulation, hinged lid. Fresh water cockpit shower/wash down (cold only). LPG deck storage bin with 10 Ib. aluminum propane tank (plus room for spare), drain overboard. Mechanical/Electrical/Plumbing 40 HP Yanmar ® 3JH2E diesel - three cylinder, rubber isolation mounts on reinforced fiberglass bed with integral oil drip pan, mechanical fuel pump, fuel filter, 3 blade prop (Max-Prop, automatic feathering prop installed in 2003). Racor ® fuel filter with water separator, jacketed fuel lines w/swedged ends, auxiliary electric fuel pump w/momentary switch for servicing. Extensive sound control in engine compartment with premium lead lined foam insulation. Engine and head intake strainer - bronze. Recessed cockpit instrument panel w/electric tachometer, engine monitoring gauges & warning system, hourmeter - removable acrylic cover. Additional recess with cover for owner/dealer installed equipment Single lever engine control mounted on pedestal 3 premium AGM (absorbed glass mat) sealed 12 volt house batteries, 2 premium AGM dedicated engine startbattery (all Group 27) w/momentary parallel switch at engine control to house bank for emergency starting. Stainlesssteel hold down bar. Deluxe electric panels w/battery switch, circuit breakers for D-C & A-C systems, D-C & A-C gauges, battery testsystem, reverse polarity protection, indicator lights, elec. pump controls, LPG control, battery charger control. A-C 30 amp dockside power system w/inlet breaker, polarity protection, Two 50' shore power cord (new in 2016), numerous interior outlets w/GFCI protection, interior breaker, galvanic isolator. Marine converter/battery charger 30 amp, UL approved, temperature compensating, three step electronic charger (Heart Interface - Freedom 25 with Link 2000-R display installed). Numerous 12V interior lamps and (3) courtesy lamps with rocker switch at companionway; dome lights in cockpit lockers, forepeak, ice box, bilge. Water heater - 6 gallon marine type w/engine heat exchanger & A-C operation, UL approved, foam jacketed hosesPressure water system w/hot & cold water tap in galley & head, shower in head, cockpit (cold only)Manual water pump in galley. LPG stove system w/10 Ib. aluminum tank (in draining deck storage well), remote solenoid safety shutoff, gaugeMarine head (Raritan ® ), with large seat and bowl, triple walled sanitation hose, direct overboard discharge or bypass valve into holding tank. 30 gallon (U.S.) welded marine aluminum holding tank w/sealed interior, deck pump out fitting. 100 gallon (U.S.) welded marine aluminum fresh water tank w/deck fill, tank mounted gauge. 50 gallon (U.S.) welded marine aluminum fuel tank w/shut off valve, deck fill, tank mounted gauge. Preplumbed for additionalpick up/return. Fuel, water and holding tankage below cabin sole maximizing storage space & minimizing trim changes. Deck fittings for water, fuel, waste - stainless steel w/deck key. Electric bilge pump w/auto switch, premium Ultimate ® magnetic reed float switch (Rule 3700 Pump installed 2002). Manual bilge pump - 1..../2 " hose. Mounted in cockpit near helm. Shower drain pump - electric w/switch. Ice box drain pump - electric w/switch. UL approved bronze thru-bolted flanged seacocks on all thru-hulls below waterline; ball valves on all thru-hulls in boot stripe. Electrical D-C grounding system for rig and underwater metals. UL approved marine, pretinned color coded wiring. Foredeck light-mast mounted. Masthead anchor light, nav lights. Pre-wired: anchor windlass power supply and remote control wires; VHF antenna cable in mast & interior; fan and speaker wires throughout interior; refrigeration wire. Messenger pre-run for cabin back mounted electronics. three (3) Group 27 AGM sealed house batteries; two (2) Group 27 AGM sealed dedicated engine start battery; Electric windlass (Maxwell VWC 1200). Rubrail – coextruded hi-impact vinyl molded in hull color – w/s.s. striker. Roller furling mast with spare halyard. Cockpit cushions (6 pc) - 2" closed cell foam with Textaline ® covers. BOOT STRIPE COLOR CANVAS COLOR: Green Specifications Displacement (Approx.) .................... 16,000 lbs.Ballast ............................................... 7,500 lbs.Sail Area ... (100% F.T.) 725 sq. ft. (incl. stays’l)Auxiliary Power .................... 40 HP FWC dieselWater Capacity ........................ 100 U.S. gallonsFuel Capacity .............................. 50 U.S. gallonsDesigner ................................ Bob Johnson, N.A.LOA ........................................................... 36'10"LWL............................................................. 29'4"Beam............................................................ 12'0"Draft (Standard) .......................................... 4'3"Mast Above DWL ........................................ 48'4"Cabins/Berths ................................................ 3/7Headroom ..................................................... 6'4"
The original Yanmar 3JH2E engine has 1080 hours on her. The wind, nav, depth, and autopilot are B&G instruments. Radar is Furuno. Has a Maxwell windless. Has a Heart Interface Freedom 25 converter/30A-battery charger. Put in 5 new batteries in 2016. Solar Panel to trickle charge battery bank #1. Has a Nauti Kold cold box that works great and is very efficient. Has a Cruisair air conditioning system that has been keeping things nice and cool (new in 2009). Flat screen TV, DVD player, and AM/FM CD player. There are 24 aluminum folding steps that have been mounted all the way up to the mast head to make single handed maintenance a lot easier. Two extremely special Island Packet name and logo stainless steel fancy step plates were installed to make going aboard on the port or starboard side, that much more special. Purchased in 2003, upgraded and always kept everything in excellent condition until 3 years ago when I stopped sailing. Since then, I periodically run the engine at the dock, keep up on bottom cleaning, and keep a/c running 24/7. The engine runs great. The transmission is stuck in forward (not the cable). The trans never had a problem before this period of me not using my boat. The bow-thruster needs replacing (a great feature to have). Original sails are in good shape but sheet lines could use replacing. The Bimini Top is removed due to a rip and the zipper becoming unstitched. Dodger's plastic windows are foggy. Inside teak is beautiful but the outside teak needs the remaining varnish removed and reapplied. The complete interior looks brand new and has no foul smells. The bottom needs repainting. I got an estimate of $3811 to replace the bow thruster. Bottom paint job and a boat haul have cost about $1000 in the past. I guesstimate to remove, repair, and install the transmission could cost about $2500. I choose to Document (thru the US Coast Guard) this IP-350 in 2003 versus titling it in the state because of these advantages:1- Provides clear history of ownership and priority when obtaining a loan.2- Affords international rights, privileges, and protections when in international waters, 3- Easier and less expense of ownership and cost to transfer of ownership, and of course no need to deal with DMV.4- Required for certain usages, Additionally includes: Unused 8.5' dingy purchased in 2014 and has Mercury outboard that can store on a IP-350's stern rail mount. Both have been stored indoors. All manuals and documents for every component, kept well filed in an Island Packet documents bag. All receipts and files from time of purchase in 2003. Two large plastic bins that contain lots and lots of spare maintenance parts. New condition and unused spare dodger (but in yellow). Sail bags, 10 one inch thick dock lines, life jackets, dock poles, grill that mounts at stern, safety equipment and much more. 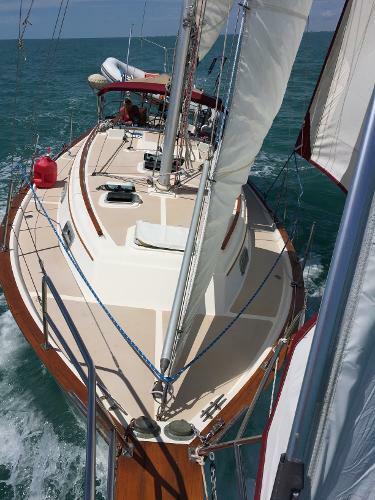 ISLAND PACKET 350 - STANDARD SPECIFICATIONS & EQUIPMENTYACHT CONSTRUCTION, CERTIFIED CATEGORY A – OCEAN Rig / Sails / Hardware Sails: Roller furling main for standard in-mast system, 130% roller furling genoa, roller furling staysail -Genoa & staysail sun panels are green. Genoa gear, including tracks, blocks, sheets and Harken ® furling system. Staysail gear including blocks, halyard, sheet, Harken ® furling system and Hoyt self vanging boom. Jib halyard winch on mast, Lewmar ® 16C 2-speed. Mainsail gear, including halyard on mast led to Lewmar 16C winch; main sheet traveler w/4:1 control system led to cockpit; roller furling lines, sheet, and spare main halyard led to cockpit through stoppers to Lewmar 30CST winches. Spare main halyard (on roller bearing masthead sheave) led to cockpit through stopper to Lewmar ® 30 CST winch. All halyards internal; color coded running rigging, convenient coaming storage bins for lines. Boom vang. Winch handle -10" lock-in chrome - Lewmar "PowerGrip ® " Jib sheet winches (2) Lewmar ® 40 CST 2-speed. Mid-boom sheeting for unobstructed cockpit & dodger installations. Wheel steering - console mounted Whitlock "Premier XL" rack & pinion direct system w/"Monarch" style hood for electronicsinstallations, wheel brake, stainless steel wheel. Guard, single lever engine control. Emergency tiller with storage brackets in sail locker. Compass, Ritchie ® with custom Island Packet nav grid. Welded stainless steel double bow rail & stern rail, stanchions, stern rail with twin seats, stainless steel flag staff & holder. Double lifelines w/side gates, full length stainless steel cabin top hand rails. Teak step pads at lifeline gates with reefing line hold down recess. Hinged padeyes (4) for cockpit harness attachment. Stern gate w/quick release hook. Swim ladder - stainless steel transom mount w/rubber treads. Two SeaSafe TM patented stainless steel anchor rollers w/chocks and hinged deck pipes to forepeak. Four 12" mooring cleats, two 10" spring line cleats, chocks & flush mount stainless steel chafe guards. Twin backstays for easy stern boarding & unobstructed helm seating. Topping lift-adjustable. Keel stepped mast, all anodized spars. Interior Eleven opening ports w/screens - polished stainless steel, safety glass. Five deck hatches - forward cabin, salon, head, aft cabin, galley-Lewmar ® (acrylic & aluminum). Three deck ventilators (Dorade type) w/screens. Large forepeak w/louvered access door & overhead deck pipes, light, drain to bilge, Starboard ® shelf to direct rode aft; center divider w/ attachment for rodes. Forward cabin w/privacy doors to salon & head compartment. Large double Pullman berth w/teak shelves outboard,stowage under. Dressing seat, cedar lined hanging locker w/shelf over, bureau w/shelf over. Two opening ports plusoverhead hatch, deck vent, varnished teak & holly sole. Forward head w/shower (electric drain pump), teak trim, curtain on track, large vanity with polished stainless steel sink, teak shower seat, storage cabinets, opening port & an overhead hatch, toothbrush holder w/cup, toilet paper holder, integral recessed lighting. Main salon w/L-shaped pull-out double settee berth to starboard, single settee berth to port, teak cabinets & book shelves outboard of both settees. Large stowage areas behind & under each settee. Cedar lined hanging locker w/shelf over. Deluxe drop leaf table folds against bulkhead rack (w/bottle stowage) for unobstructed 4' wide varnished teak & holly sole. Large overhead hatch, numerous opening ports, deck vents & overhead handrails. 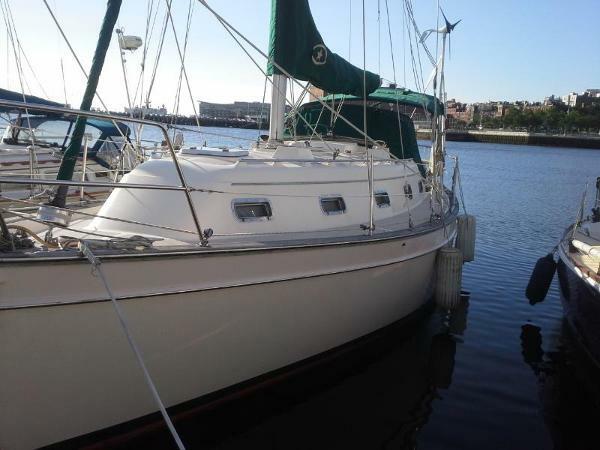 Navigation station w/table at aft end of port settee, nav light, generous nav/electronics cabinet w/master A-C/D-C electricalpanel plus room for owner installed equipment Chart stowage drawer beneath starboard settee. Aft cabin w/privacy door to main cabin. Large athwartship double berth w/teak shelf outboard, integral overhead reading lights, stowage lockers under. Cedar lined hanging locker w/shelf over, bureau w/shelf over, two opening ports plus overhead hatch, varnished teak & holly sole. Courtesy/night lights with switch by companionway. All interior cushions of upholstery grade dual density foam covered in premium designer fabric. Removable teak companionway ladder w/engine access from all sides. Storage rack for companionway drop boards. Molded slip resistant cabin sole adjacent to companionway, galley & nav station, w/draining grate in front of ladder. Teak gratelifts out for dust pan, dust pan lifts for bilge sump access with light. Teak bulkheads, cabinetry, trim - select grain w/ hand rubbed oil finish. Teak louvered cabin & locker doors - deluxe trim; push button safety latches on locker doors. Molded fiberglass interior headliner w/textured finish, teak trim. Teak & holly sole in main salon, forward & aft cabins - varnish finish. Galley Large u-shaped design w/high pressure laminate surfaces, teak sea rails on all edges. Ice box - top loading, injected froth type urethane insulation throughout, lift-out shelf, electric drain pump, inside light w/manual switch. Gimballed two burner LPG stove w/oven - black finish stainless steel deluxe safety type w/sealed burner top, lift off cover w/storage, rack below, stainless steel guard rail w/harness hooks. Pot and pan locker under. Double stainless steel sink with deluxe polished finish, hot & cold pressure water tap, manual pump, retractable spray unit. Roll-away trash bin, teak paper towel holder & soap rack. Deluxe teak dish rack & cutlery drawers. Large storage areas above & below counter, two large drawers beneath icebox, dry storage locker. Cockpit instrument access cabinet. Exterior/Construction 100% hand laid high modulus fiberglass construction throughout with special gelcoats for durability. All gelcoats applied using premium high volume, low pressure application equipment for exceptional finish quality, reduced airborne emissions. Island Packet’s exclusive PolyClad ® 2 hull bottom gelcoat system with Hull molded in one piece utilizing a proprietary pressure fed application system w/high modulus triaxial glass, unified w/an engineered interior grid structure and molded structural base unit. Deck laminate cored w/advanced PolyCore ® - a proprietary microsphere & resin matrix with 10 year limited warranty for rot and delamination (an industry first). Exclusive Durashield™ deck, hull topside and interior gelcoat system with superior gloss retention and resistance to fading and crazing. Deck attached to integrally molded hull flange w/bolts, lock nuts, & urethane adhesive sealant. Deck hardware thru-bolted w/aluminum backup plates Two-tone deck - low-glare light ivory with integrally molded light tan slip resistant surface (premium coarse diamond pattern)Light ivory hull with matching co-extruded, hi-impact vinyl rubrail, s.s. striker, green boot stripe. Teak cap rail w/stainless steel striker, teak cap on bowsprit. Deluxe helm console with guard/handgrip, compass, single lever engine control, space for electronics (B&G Wind, Nav, and Autopilot installed). Contoured cockpit seats 7..../ 2 feet long, coaming storage boxes and bins, seat hatches with push button latches, locks, and support struts, molded helm seat with teak top, cushion and backrest. Two stern rail seats. Molded fiberglass sliding companionway hatch w/sea hood, latch inside, exterior hasp and lock. Integral molded dodger mount on cabin top. Companionway drop boards of solid teak, center drop board fitted with fixed port with etched logo (safety glass), captive safety lock-in pin with holder, interior storage rack. All exterior teak treated with Sikkens Cetol ® teak finish. Two 2" cockpit scuppers. Cockpit ice box - foam insulation, hinged lid. Fresh water cockpit shower/wash down (cold only). LPG deck storage bin with 10 Ib. aluminum propane tank (plus room for spare), drain overboard. Mechanical/Electrical/Plumbing 40 HP Yanmar ® 3JH2E diesel - three cylinder, rubber isolation mounts on reinforced fiberglass bed with integral oil drip pan, mechanical fuel pump, fuel filter, 3 blade prop (Max-Prop, automatic feathering prop installed in 2003). Racor ® fuel filter with water separator, jacketed fuel lines w/swedged ends, auxiliary electric fuel pump w/momentary switch for servicing. Extensive sound control in engine compartment with premium lead lined foam insulation. Engine and head intake strainer - bronze. Recessed cockpit instrument panel w/electric tachometer, engine monitoring gauges & warning system, hourmeter - removable acrylic cover. Additional recess with cover for owner/dealer installed equipment Single lever engine control mounted on pedestal 3 premium AGM (absorbed glass mat) sealed 12 volt house batteries, 2 premium AGM dedicated engine startbattery (all Group 27) w/momentary parallel switch at engine control to house bank for emergency starting. Stainlesssteel hold down bar. Deluxe electric panels w/battery switch, circuit breakers for D-C & A-C systems, D-C & A-C gauges, battery testsystem, reverse polarity protection, indicator lights, elec. pump controls, LPG control, battery charger control. A-C 30 amp dockside power system w/inlet breaker, polarity protection, Two 50' shore power cord (new in 2016), numerous interior outlets w/GFCI protection, interior breaker, galvanic isolator. Marine converter/battery charger 30 amp, UL approved, temperature compensating, three step electronic charger (Heart Interface - Freedom 25 with Link 2000-R display installed). Numerous 12V interior lamps and (3) courtesy lamps with rocker switch at companionway; dome lights in cockpit lockers, forepeak, ice box, bilge. Water heater - 6 gallon marine type w/engine heat exchanger & A-C operation, UL approved, foam jacketed hosesPressure water system w/hot & cold water tap in galley & head, shower in head, cockpit (cold only)Manual water pump in galley. LPG stove system w/10 Ib. aluminum tank (in draining deck storage well), remote solenoid safety shutoff, gaugeMarine head (Raritan ® ), with large seat and bowl, triple walled sanitation hose, direct overboard discharge or bypass valve into holding tank. 30 gallon (U.S.) welded marine aluminum holding tank w/sealed interior, deck pump out fitting. 100 gallon (U.S.) welded marine aluminum fresh water tank w/deck fill, tank mounted gauge. 50 gallon (U.S.) welded marine aluminum fuel tank w/shut off valve, deck fill, tank mounted gauge. Preplumbed for additionalpick up/return. Fuel, water and holding tankage below cabin sole maximizing storage space & minimizing trim changes. Deck fittings for water, fuel, waste - stainless steel w/deck key. Electric bilge pump w/auto switch, premium Ultimate ® magnetic reed float switch (Rule 3700 Pump installed 2002). Manual bilge pump - 1..../2 " hose. Mounted in cockpit near helm. Shower drain pump - electric w/switch. Ice box drain pump - electric w/switch. UL approved bronze thru-bolted flanged seacocks on all thru-hulls below waterline; ball valves on all thru-hulls in boot stripe. Electrical D-C grounding system for rig and underwater metals. UL approved marine, pretinned color coded wiring. Foredeck light-mast mounted. Masthead anchor light, nav lights. Pre-wired: anchor windlass power supply and remote control wires; VHF antenna cable in mast & interior; fan and speaker wires throughout interior; refrigeration wire. Messenger pre-run for cabin back mounted electronics. three (3) Group 27 AGM sealed house batteries; two (2) Group 27 AGM sealed dedicated engine start battery; Electric windlass (Maxwell VWC 1200). Rubrail – coextruded hi-impact vinyl molded in hull color – w/s.s. striker. Roller furling mast with spare halyard. Cockpit cushions (6 pc) - 2" closed cell foam with Textaline ® covers. BOOT STRIPE COLOR CANVAS COLOR: Green Specifications Displacement (Approx.) .................... 16,000 lbs.Ballast ............................................... 7,500 lbs.Sail Area ... (100% F.T.) 725 sq. ft. (incl. stays’l)Auxiliary Power .................... 40 HP FWC dieselWater Capacity ........................ 100 U.S. gallonsFuel Capacity .............................. 50 U.S. gallonsDesigner ................................ Bob Johnson, N.A.LOA ........................................................... 36'10"LWL............................................................. 29'4"Beam............................................................ 12'0"Draft (Standard) .......................................... 4'3"Mast Above DWL ........................................ 48'4"Cabins/Berths ................................................ 3/7Headroom ..................................................... 6'4"
The original Yanmar 3JH2E engine has 1080 hours on her. The wind, nav, depth, and autopilot are B&G instruments. Radar is Furuno. Has a Maxwell windless. Has a Heart Interface Freedom 25 converter/30A-battery charger. Put in 5 new batteries in 2016. Solar Panel to trickle charge battery bank #1. Has a Nauti Kold cold box that works great and is very efficient. Has a Cruisair air conditioning system that has been keeping things nice and cool (new in 2009). Flat screen TV, DVD player, and AM/FM CD player. There are 24 aluminum folding steps that have been mounted all the way up to the mast head to make single handed maintenance a lot easier. Two extremely special Island Packet name and logo stainless steel fancy step plates were installed to make going aboard on the port or starboard side, that much more special. Purchased in 2003, upgraded and always kept everything in excellent condition until 3 years ago when I stopped sailing. Since then, I periodically run the engine at the dock, keep up on bottom cleaning, and keep a/c running 24/7. The engine runs great. The transmission is stuck in forward (not the cable). The trans never had a problem before this period of me not using my boat. The bow-thruster needs replacing (a great feature to have). Original sails are in good shape but sheet lines could use replacing. The Bimini Top is removed due to a rip and the zipper becoming unstitched. Dodger's plastic windows are foggy. Inside teak is beautiful but the outside teak needs the remaining varnish removed and reapplied. The complete interior looks brand new and has no foul smells. The bottom needs repainting. I got an estimate of $3811 to replace the bow thruster. Bottom paint job and a boat haul have cost about $1000 in the past. I guesstimate to remove, repair, and install the transmission could cost about $2500. 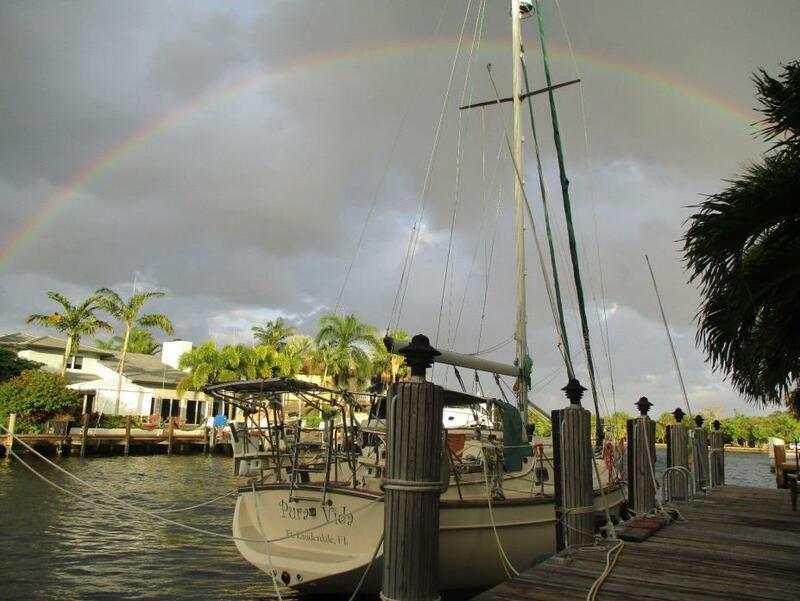 This IP-350 is documented, which has many advantages (1- Priority in obtaining a loan due to clear history of ownership, 2- Affords international rights, privileges, and protections when in international waters, 3- Required for certain usages, 4- Easy transfer without need to register with DMV. Additionally includes: Unused 8.5' dingy purchased in 2014 and has Mercury outboard that can store on a IP-350's stern rail mount. Both have been stored indoors. All manuals and documents for every component, kept well filed in an Island Packet documents bag. All receipts and files from time of purchase in 2003. Two large plastic bins that contain lots and lots of spare maintenance parts. New condition and unused spare dodger (but in yellow). Sail bags, 10 one inch thick dock lines, life jackets, dock poles, grill that mounts at stern, safety equipment and much more. ISLAND PACKET 350 - STANDARD SPECIFICATIONS & EQUIPMENTYACHT CONSTRUCTION, CERTIFIED CATEGORY A – OCEAN Rig / Sails / Hardware Sails: Roller furling main for standard in-mast system, 130% roller furling genoa, roller furling staysail -Genoa & staysail sun panels are green. Genoa gear, including tracks, blocks, sheets and Harken ® furling system. Staysail gear including blocks, halyard, sheet, Harken ® furling system and Hoyt self vanging boom. Jib halyard winch on mast, Lewmar ® 16C 2-speed. Mainsail gear, including halyard on mast led to Lewmar 16C winch; main sheet traveler w/4:1 control system led to cockpit; roller furling lines, sheet, and spare main halyard led to cockpit through stoppers to Lewmar 30CST winches. Spare main halyard (on roller bearing masthead sheave) led to cockpit through stopper to Lewmar ® 30 CST winch. All halyards internal; color coded running rigging, convenient coaming storage bins for lines. Boom vang. Winch handle -10" lock-in chrome - Lewmar "PowerGrip ® " Jib sheet winches (2) Lewmar ® 40 CST 2-speed. Mid-boom sheeting for unobstructed cockpit & dodger installations. Wheel steering - console mounted Whitlock "Premier XL" rack & pinion direct system w/"Monarch" style hood for electronicsinstallations, wheel brake, stainless steel wheel. Guard, single lever engine control. Emergency tiller with storage brackets in sail locker. Compass, Ritchie ® with custom Island Packet nav grid. Welded stainless steel double bow rail & stern rail, stanchions, stern rail with twin seats, stainless steel flag staff & holder. Double lifelines w/side gates, full length stainless steel cabin top hand rails. Teak step pads at lifeline gates with reefing line hold down recess. Hinged padeyes (4) for cockpit harness attachment. Stern gate w/quick release hook. Swim ladder - stainless steel transom mount w/rubber treads. Two SeaSafe TM patented stainless steel anchor rollers w/chocks and hinged deck pipes to forepeak. Four 12" mooring cleats, two 10" spring line cleats, chocks & flush mount stainless steel chafe guards. Twin backstays for easy stern boarding & unobstructed helm seating. Topping lift-adjustable. Keel stepped mast, all anodized spars. Interior Eleven opening ports w/screens - polished stainless steel, safety glass. Five deck hatches - forward cabin, salon, head, aft cabin, galley-Lewmar ® (acrylic & aluminum). Three deck ventilators (Dorade type) w/screens. Large forepeak w/louvered access door & overhead deck pipes, light, drain to bilge, Starboard ® shelf to direct rode aft; center divider w/ attachment for rodes. Forward cabin w/privacy doors to salon & head compartment. Large double Pullman berth w/teak shelves outboard,stowage under. Dressing seat, cedar lined hanging locker w/shelf over, bureau w/shelf over. Two opening ports plusoverhead hatch, deck vent, varnished teak & holly sole. Forward head w/shower (electric drain pump), teak trim, curtain on track, large vanity with polished stainless steel sink, teak shower seat, storage cabinets, opening port & an overhead hatch, toothbrush holder w/cup, toilet paper holder, integral recessed lighting. Main salon w/L-shaped pull-out double settee berth to starboard, single settee berth to port, teak cabinets & book shelves outboard of both settees. Large stowage areas behind & under each settee. Cedar lined hanging locker w/shelf over. Deluxe drop leaf table folds against bulkhead rack (w/bottle stowage) for unobstructed 4' wide varnished teak & holly sole. Large overhead hatch, numerous opening ports, deck vents & overhead handrails. Navigation station w/table at aft end of port settee, nav light, generous nav/electronics cabinet w/master A-C/D-C electricalpanel plus room for owner installed equipment Chart stowage drawer beneath starboard settee. Aft cabin w/privacy door to main cabin. Large athwartship double berth w/teak shelf outboard, integral overhead reading lights, stowage lockers under. Cedar lined hanging locker w/shelf over, bureau w/shelf over, two opening ports plus overhead hatch, varnished teak & holly sole. Courtesy/night lights with switch by companionway. All interior cushions of upholstery grade dual density foam covered in premium designer fabric. Removable teak companionway ladder w/engine access from all sides. Storage rack for companionway drop boards. Molded slip resistant cabin sole adjacent to companionway, galley & nav station, w/draining grate in front of ladder. Teak gratelifts out for dust pan, dust pan lifts for bilge sump access with light. Teak bulkheads, cabinetry, trim - select grain w/ hand rubbed oil finish. Teak louvered cabin & locker doors - deluxe trim; push button safety latches on locker doors. Molded fiberglass interior headliner w/textured finish, teak trim. Teak & holly sole in main salon, forward & aft cabins - varnish finish. Galley Large u-shaped design w/high pressure laminate surfaces, teak sea rails on all edges. Ice box - top loading, injected froth type urethane insulation throughout, lift-out shelf, electric drain pump, inside light w/manual switch. Gimballed two burner LPG stove w/oven - black finish stainless steel deluxe safety type w/sealed burner top, lift off cover w/storage, rack below, stainless steel guard rail w/harness hooks. Pot and pan locker under. Double stainless steel sink with deluxe polished finish, hot & cold pressure water tap, manual pump, retractable spray unit. Roll-away trash bin, teak paper towel holder & soap rack. Deluxe teak dish rack & cutlery drawers. Large storage areas above & below counter, two large drawers beneath icebox, dry storage locker. Cockpit instrument access cabinet. Exterior/Construction 100% hand laid high modulus fiberglass construction throughout with special gelcoats for durability. All gelcoats applied using premium high volume, low pressure application equipment for exceptional finish quality, reduced airborne emissions. Island Packet’s exclusive PolyClad ® 2 hull bottom gelcoat system with Hull molded in one piece utilizing a proprietary pressure fed application system w/high modulus triaxial glass, unified w/an engineered interior grid structure and molded structural base unit. Deck laminate cored w/advanced PolyCore ® - a proprietary microsphere & resin matrix with 10 year limited warranty for rot and delamination (an industry first). Exclusive Durashield™ deck, hull topside and interior gelcoat system with superior gloss retention and resistance to fading and crazing. Deck attached to integrally molded hull flange w/bolts, lock nuts, & urethane adhesive sealant. Deck hardware thru-bolted w/aluminum backup plates Two-tone deck - low-glare light ivory with integrally molded light tan slip resistant surface (premium coarse diamond pattern)Light ivory hull with matching co-extruded, hi-impact vinyl rubrail, s.s. striker, green boot stripe. Teak cap rail w/stainless steel striker, teak cap on bowsprit. Deluxe helm console with guard/handgrip, compass, single lever engine control, space for electronics (B&G Wind, Nav, and Autopilot installed). Contoured cockpit seats 7..../ 2 feet long, coaming storage boxes and bins, seat hatches with push button latches, locks, and support struts, molded helm seat with teak top, cushion and backrest. Two stern rail seats. Molded fiberglass sliding companionway hatch w/sea hood, latch inside, exterior hasp and lock. Integral molded dodger mount on cabin top. Companionway drop boards of solid teak, center drop board fitted with fixed port with etched logo (safety glass), captive safety lock-in pin with holder, interior storage rack. All exterior teak treated with Sikkens Cetol ® teak finish. Two 2" cockpit scuppers. Cockpit ice box - foam insulation, hinged lid. Fresh water cockpit shower/wash down (cold only). LPG deck storage bin with 10 Ib. aluminum propane tank (plus room for spare), drain overboard. Mechanical/Electrical/Plumbing 40 HP Yanmar ® 3JH2E diesel - three cylinder, rubber isolation mounts on reinforced fiberglass bed with integral oil drip pan, mechanical fuel pump, fuel filter, 3 blade prop (Max-Prop, automatic feathering prop installed in 2003). Racor ® fuel filter with water separator, jacketed fuel lines w/swedged ends, auxiliary electric fuel pump w/momentary switch for servicing. Extensive sound control in engine compartment with premium lead lined foam insulation. Engine and head intake strainer - bronze. Recessed cockpit instrument panel w/electric tachometer, engine monitoring gauges & warning system, hourmeter - removable acrylic cover. Additional recess with cover for owner/dealer installed equipment Single lever engine control mounted on pedestal 3 premium AGM (absorbed glass mat) sealed 12 volt house batteries, 2 premium AGM dedicated engine startbattery (all Group 27) w/momentary parallel switch at engine control to house bank for emergency starting. Stainlesssteel hold down bar. Deluxe electric panels w/battery switch, circuit breakers for D-C & A-C systems, D-C & A-C gauges, battery testsystem, reverse polarity protection, indicator lights, elec. pump controls, LPG control, battery charger control. A-C 30 amp dockside power system w/inlet breaker, polarity protection, Two 50' shore power cord (new in 2016), numerous interior outlets w/GFCI protection, interior breaker, galvanic isolator. Marine converter/battery charger 30 amp, UL approved, temperature compensating, three step electronic charger (Heart Interface - Freedom 25 with Link 2000-R display installed). Numerous 12V interior lamps and (3) courtesy lamps with rocker switch at companionway; dome lights in cockpit lockers, forepeak, ice box, bilge. Water heater - 6 gallon marine type w/engine heat exchanger & A-C operation, UL approved, foam jacketed hosesPressure water system w/hot & cold water tap in galley & head, shower in head, cockpit (cold only)Manual water pump in galley. LPG stove system w/10 Ib. aluminum tank (in draining deck storage well), remote solenoid safety shutoff, gaugeMarine head (Raritan ® ), with large seat and bowl, triple walled sanitation hose, direct overboard discharge or bypass valve into holding tank. 30 gallon (U.S.) welded marine aluminum holding tank w/sealed interior, deck pump out fitting. 100 gallon (U.S.) welded marine aluminum fresh water tank w/deck fill, tank mounted gauge. 50 gallon (U.S.) welded marine aluminum fuel tank w/shut off valve, deck fill, tank mounted gauge. Preplumbed for additionalpick up/return. Fuel, water and holding tankage below cabin sole maximizing storage space & minimizing trim changes. Deck fittings for water, fuel, waste - stainless steel w/deck key. Electric bilge pump w/auto switch, premium Ultimate ® magnetic reed float switch (Rule 3700 Pump installed 2002). Manual bilge pump - 1..../2 " hose. Mounted in cockpit near helm. Shower drain pump - electric w/switch. Ice box drain pump - electric w/switch. UL approved bronze thru-bolted flanged seacocks on all thru-hulls below waterline; ball valves on all thru-hulls in boot stripe. Electrical D-C grounding system for rig and underwater metals. UL approved marine, pretinned color coded wiring. Foredeck light-mast mounted. Masthead anchor light, nav lights. Pre-wired: anchor windlass power supply and remote control wires; VHF antenna cable in mast & interior; fan and speaker wires throughout interior; refrigeration wire. Messenger pre-run for cabin back mounted electronics. three (3) Group 27 AGM sealed house batteries; two (2) Group 27 AGM sealed dedicated engine start battery; Electric windlass (Maxwell VWC 1200). Rubrail – coextruded hi-impact vinyl molded in hull color – w/s.s. striker. Roller furling mast with spare halyard. Cockpit cushions (6 pc) - 2" closed cell foam with Textaline ® covers. BOOT STRIPE COLOR CANVAS COLOR: Green Specifications Displacement (Approx.) .................... 16,000 lbs.Ballast ............................................... 7,500 lbs.Sail Area ... (100% F.T.) 725 sq. ft. (incl. stays’l)Auxiliary Power .................... 40 HP FWC dieselWater Capacity ........................ 100 U.S. gallonsFuel Capacity .............................. 50 U.S. gallonsDesigner ................................ Bob Johnson, N.A.LOA ........................................................... 36'10"LWL............................................................. 29'4"Beam............................................................ 12'0"Draft (Standard) .......................................... 4'3"Mast Above DWL ........................................ 48'4"Cabins/Berths ................................................ 3/7Headroom ..................................................... 6'4"
1997 Island Packet 350 HAVEN - Is new to the market and has been respectively cared for over the years by her current owner. Island Packets are renowned for quality of construction and seakeeping abilities. The IP 350 has the room and accommodations of a much larger boat. Yet she can be easily single-handed or sailed by a couple. Haven is available and easy to show. More photos coming soon. Go to specs to view full listing.